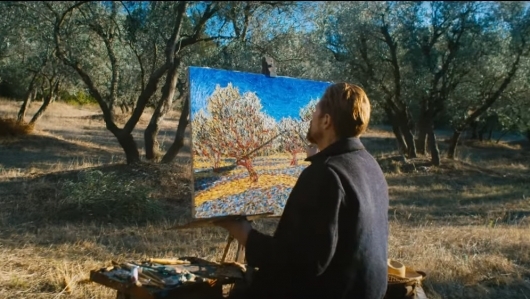 Contributed by Sharon Butler / While watching At Eternity’s Gate, Julian Schnabel’s new film about Vincent Van Gogh, I wondered if Schnabel had made the paintings and drawings himself, and it turns out he did. 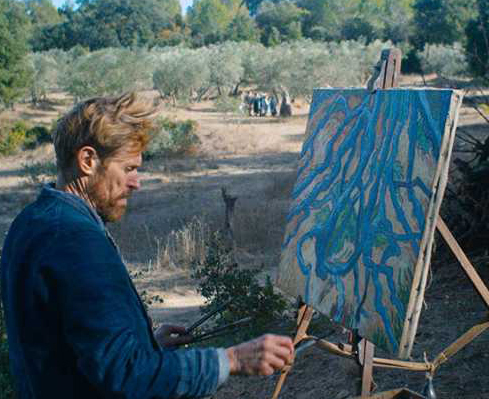 “When Willem [Dafoe as Van Gogh] is drawing, sometimes my arm is in one sleeve of his shirt…luckily Willem’s hands and mine look pretty similar,” he said in an interview with Nicholas Vivarelli in Variety. “I also did the painting he’s doing outside when he’s doing the landscape. The art department sent this painting that was absolutely unacceptable. I painted something in 20 minutes just to make it look viable. “I would just stand there and I would be painting (check out 1:11 in the trailer posted above). The paintings on the wall, for example, the [famous] self-portrait with the pipe. I needed to paint it so it looked like Willem as van Gogh, but it also had to look pretty much like the original painting, and so I made a couple of those. And also the Gaugain painting that’s on the wall, I painted Oscar Isaac as Gauguin!” Read more. At Eternity’s Gate, directed by Julian Schnabel. I look forward to seeing this film now. Having recently learned about Julian and his plate paintings. I’m excited to see a film about an artist from a director who is also a painter.